I was the women’s winner at the Kingdom Marathon! Doin’ the dirt from Pie to Pie. 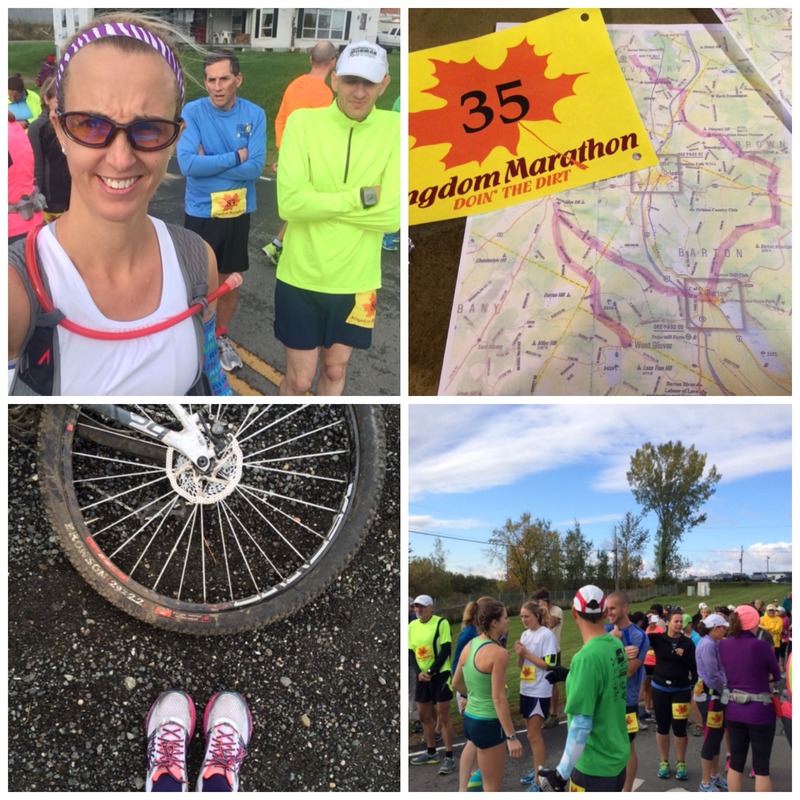 The Kingdom Marathon. The Kingdom Marathon. Running into the finish! On Saturday I turned 38 and on Sunday I was the women’s winner at the first annual Kingdom Marathon! What?!?! First place in a marathon. 26.2 (actually 26.5 miles in this race!) 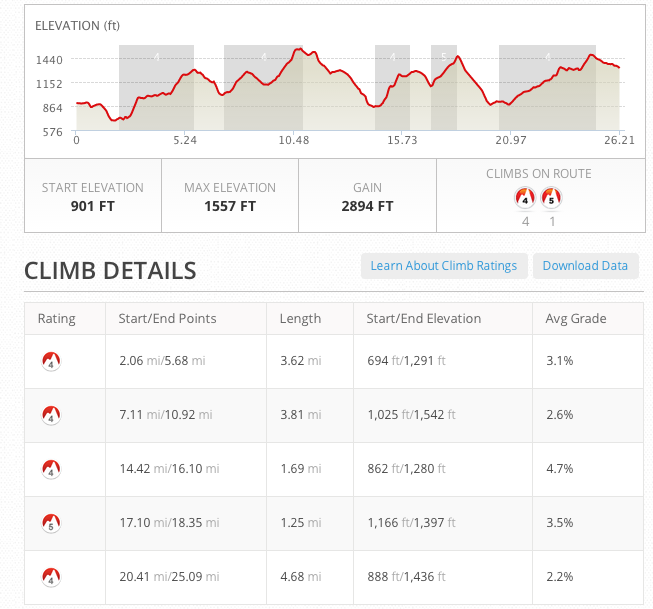 crazy hilly miles with a total ascent of 2,894 feet. Yikes! 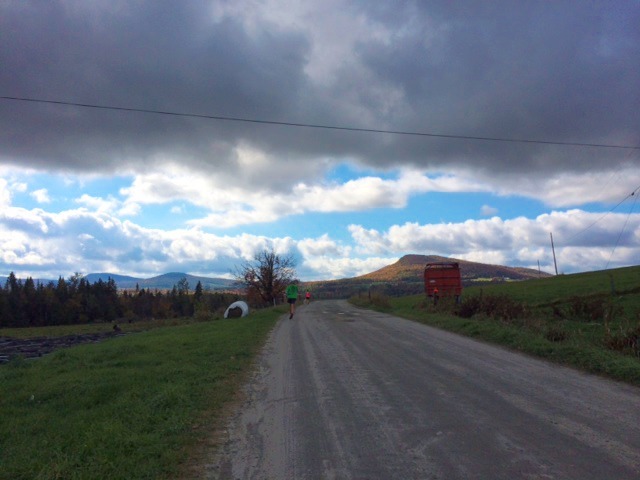 The true gift was the gorgeous scenery as we ran “From Pie to Pie” from Parker Wings in Newport, Vermont to Parker Pie in Glover, Vermont. My friend Joanna convinced me to sign up for this 26.2 mile dirt road running “adventure” pretty much at the last minute.That’s right, no specific marathon training plans were followed but I definitely had the miles under my belt to complete the distance. At Parker Wings ready to race! At the last minute my friend Joanna to switch to biking the out and back option and wrangled Organic Runner Dad into biking it with her. 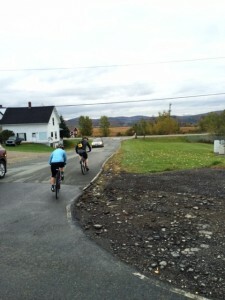 The out and back option gave them a solid ride of about 43 miles and yes they too had to tackle the endless hills! Here we are! 2 riders and 1 runner ready to take on the Kingdom Marathon! 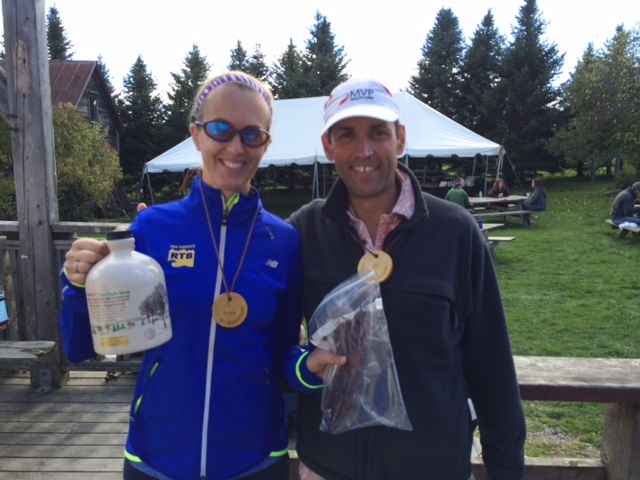 Go Organic Runner Dad and Joanna!!!! After they left on their bikes I still had a half an hour to get mentally prepared for the run and to figure out what I was going to wear. The day started out as a chilly blustery 45 degrees so I was hesitant to ditch my warm jacket but in the end decided to go with my original race day outfit because I knew I’d end up being too hot! This ended up being a great decision because they sun came out an with al of the hills I had to climb I was hot and sweaty! 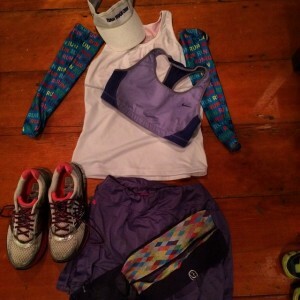 I wore some race day favorites from Skirt Sports, Nike, Gone For a Run, Crazy Compression and of course my Brooks Adrenaline. I ditched the visor as the rains had passed and wore my one of my usual crazy headbands. Finally it was time to start. Everything was so relaxed some of us were almost ready to run the wrong way out of the driveway. This started the race of with some good laughs. I decided to treat this run with the mindset of a training run and to go out and have a great time. My friend Bob and I decided to run together and settled into a comfortable pace. I wasn’t to concerned about having a crazy pace because I knew the hills would get me and I might not come out standing on the other end if I attacked the course with a fast pace from the get go (remember how I talked about running 8:05-:8:25 pace . . . that plan flew out the window when I checked out the elevation profile of the race–2894 feet of elevation gain is no joke!). 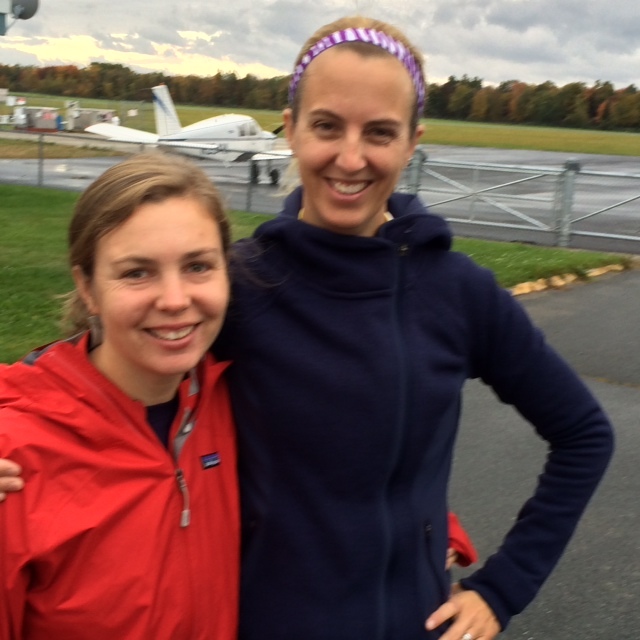 We ran and talked about running and racing and marveled at the spectacular Vermont countryside. The fall foliage was absolutely amazing especially when the sun came out from behind the clouds and set the leaves “on fire.” You couldn’t possibly pick a more perfect setting for a fall race! As we ran their were scenic sweeping landscapes dotted with farms and cows and views of the backside of lake Willoughby. I loved having a friend to run with because the miles passed much faster and we had the added benefit of his family cheering us on on the course! Rave Run. We were at about 8 miles here and there was one woman ahead of my who I ultimately passed. Bob is in the green shirt up ahead. Take a look at the elevation profile of the Kingdom Marathon. 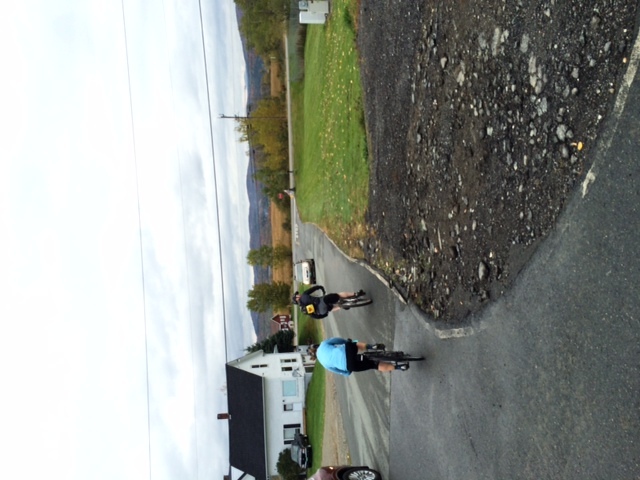 We continued on through Barton, Vermont and then headed back under the highway and up a monstrous hill. At this point Bob picked up his pace a bit and I continued to grind up the hills. It was awesome to have run together for around 16 miles because that left us with only ten miles to go. Ten miles is still along way but I was still feeling strong and ready to run. My strategy at this point was to stay steady, to keep even pacing on the uphills and to use the flats and downhills to lengthen out and relax. I tried not to focus on my watch and my splits and just ran. The Kingdom Marathon is the most beautiful marathon I have ever run! The hills were rolling at this point and my legs were definitely starting to feel tighter as the miles continued on. After a long run on a scenic ridge the hill finally took me down and out to a turn around point with a fully stocked aid station and some great volunteers. At this point I think there were 6 miles left (about a 10K). Bob and I crossed paths as he left the turnaround. He looked strong and determined to achieve a sub-four hour finish time. Between 20 and 25 miles the hills kept coming, they were not quite as long but my body was starting to feel heavier so I was glad to see Joanna and Organic Runner Dad as they passed me in the car headed back to the finish line to wait for me (they had completed their bike ride in about 3:45). The cheering was just what I needed. I saw them one more time with two miles to go at an aid station where I guzzled down some water and ate a piece of banana. Then it was on to the finish!!!! Finally the uphills turned into a final descent and I stretched my legs out to take on the final miles. Organic Runner Dad ran back to cheer me on as I came to the finish. 26.5 Miles. Kingdom Marathon. Doin’ the dirt from Pie to Pie! My final result (unofficial) was 4:10 for 26.5 (and yes that extra .3 miles felt long!) with any average pace of 9:26 min/mile! Amazingly I surprised myself by being the first place female which had me feeling super proud! 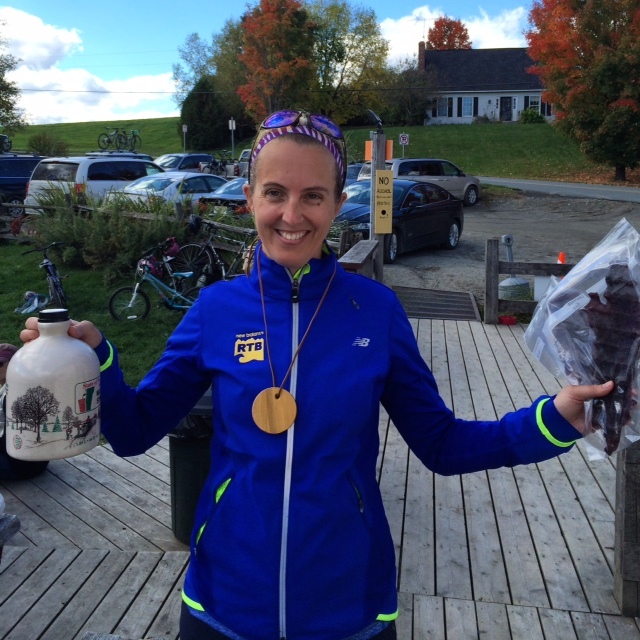 The prizes for the Kingdom Marathon were perfect–A Woodal (hand-carved wooden medal), a nice jug of Pure Vermont Maple Syrup (good thing too, as we just ran out at home!) and some homemade beef jerky (or possibly bear or moose). Since the race ended at Parker Pie we were treated to delicious wood-fired pizza and beer (although I can never stomach a beer after a marathon so I stuck to water) and we all celebrated our day together! 1st place female and 3rd place male! Even though it was a small race it’s pretty cool to be able to say that I won a marathon and I hold the women’s course record since it was the first year. I might just have to go back next year to defend my title! This was a crazy experience but you know what, I will probably do it again next year . . . thank you Joanna for convincing me to run! The views were amazing the atmosphere was low-key, the course was well marked and stocked with nutrition and hydration and the food at the end was perfect! Now, I think I’ll be taking a few days off. Up next, The CHaD Hero Half Marathon in 3 weeks. Please take the time to check out my donation page. I’d love to have your support! Congratulations on your stellar race! And what a beautiful course too. Sweet. Wow that’s quite the birthday present! Congratulations what an accomplishment! hardest race I ever did was a 10k in Aspen last summer. Altitude was a killer! Congrats on a great race! The scenery definitely makes up for all those hills! You go!! How fun that you won a marathon – that’s a story you get to tell for a VERY long time. Congrats!! 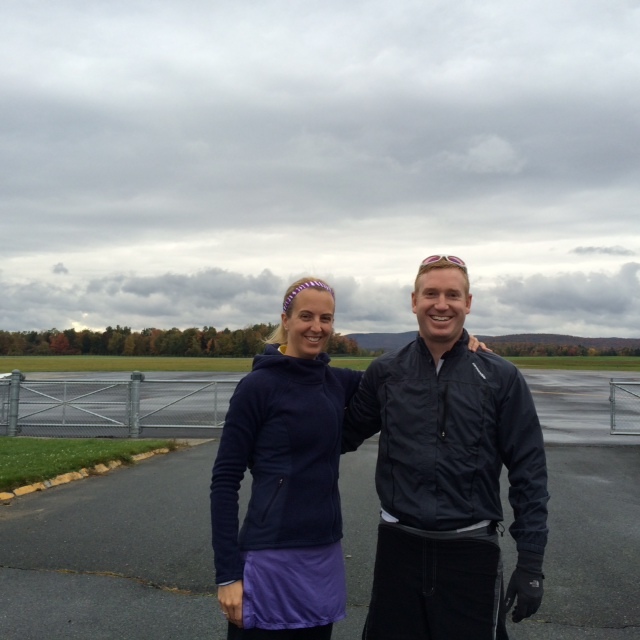 Heather @ FITaspire recently posted…What Is Fall? Congrats on such an awesome race and your win! My hardest race was my first ultra. 35 miles of the most technical trails I’ve ever run. Awesome! And woohoo for maple syrup. That reminds me that I need to buy some LOL. Happy belated birthday and congrats on your win! Every time you use the maple syrup, you’ll remember winning the race. Happy birthday and congratulations! AMAZING! What?! That is amazing!! Congrats Sandra! What a crazy elevation profile but a gorgeous and stunning course. I loved the photo that you posted on IG. And Happy Birthday! Congratulations to YOU!!! Age ain’t nothing but a number!!! Wow congrats!! Way to rock that marathon! 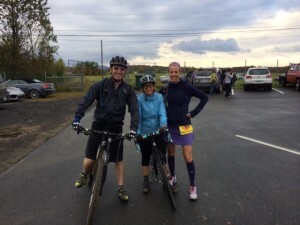 My most challenging race was the half marathon trail race that I did in July – it was tough but oh so fun!! The most prevailing feeling I get reading this was joy…you were out there enjoying yourself and just running an awesome race!!! Great job!! The scenery was gorgeous!! My most challenging race was a 25k in Gloucester, MA with 17 killer hills! This is so awesome on so many levels. Running on marathon on a whim, beautiful scenery, crazy hills, 1st place female(!!!!!) and maple syrup prize. I love it!!! Pingback: 5 tips for marathon recovery to get you back up to racing speed. Pingback: Fresh Five. 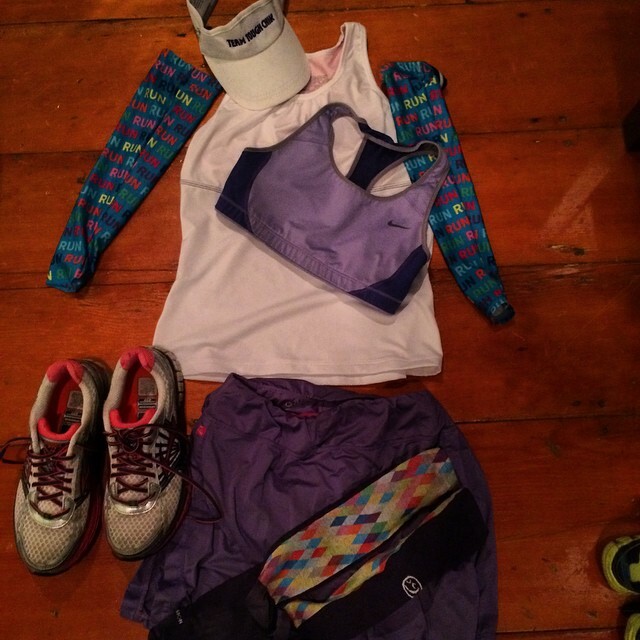 Five Running Moments that have shaped who I am.